Manual vs Motorised Treadmills: Which is Best for you? Whether you’ve already purchased a treadmill or you’re trying to learn more about your current treadmill, this beginner’s buying guide can help. We’ll be discussing the most important features and what they’re used for so that you can buy the right treadmill or use yours more effectively during your workout. The amount of incline will vary from one model to the next. The typical, maximum grade, of a treadmill will be 15 percent. As a comparison, outside terrain is said to have a normal grade of 6 excluding hills and rough terrain. If you’re just starting out on your treadmill routine, you’ll want to slowly increase your incline during your workout for peak performance. A general rule of thumb is to increase the incline every 1 – 2 minutes until you have reached your maximum. However, when running at a fast pace, you may need to adjust these levels accordingly. How fast do you expect to run on your treadmill? 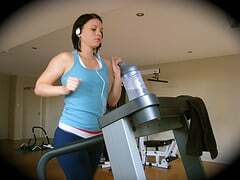 Many runners will not be able to reach the maximum speed that a treadmill can reach. Some machines can reach 16 km/h or 10 mph. If you’re wondering, you’ll be running a very fast six minute mile at this rate. If you’re a beginner, you’ll likely not reach this speed. When searching for a treadmill, you’ll want a maximum speed of at least 10 – 12 km/h. The higher end may be excessive for your needs, but it depends on your goals. If you’re a runner that wants to improve their speed and stamina, you’ll want a machine that can accommodate 12+ km/h. What this does is it forces your body to adapt and change to a vigorous workout. The speed may change, but altering speed levels throughout your workout is always a great idea. You’ll want to maintain a speed for 1 – 2 minutes before adjusting as necessary. Advanced systems will also have pre-programmed workouts that will increase your speed and incline throughout the course of your session automatically. Note: Inexpensive treadmills will often lack an on-board monitor. While not a necessity, monitors can help make your workout a little more enjoyable. There is only one safety feature that is seen on treadmills. This is a safety clip that will attach to the runner and plugs into the machine. What happens is that if you are being outpaced by the treadmill, you’ll pull the clip out of the machine and it will shut itself off. This is a feature that will only be necessary on non-manual treadmills. Note: Since electronic treadmills are rather inexpensive, non-manual treadmills are quickly becoming obsolete. Manual treadmills, however, are the complete opposite. If possible, I would personally choose an electric treadmill. While heavier and often larger in size than a manual treadmill, they offer on-board monitors, proper speed adjustments and oftentimes, incline adjustments. Storage: Many treadmills can be folded, allowing for easy storage options. Wheels: Transport is much easier when treadmills have wheels available. Warranty: Electric treadmill motors can break. Some manufacturers offer a lifetime warranty on their motors. Once you find the right treadmill and settings, you’ll be able to quickly build your stamina, lose weight and increase your fitness levels. Now you now the key features check out our latest reviews, or comparison page to check the price and features of leading treadmill models.